I miss seeing shops that I remembered, most of which have been replaced by new shops in ‘Shopping Centres’ or ‘Supermarkets’. 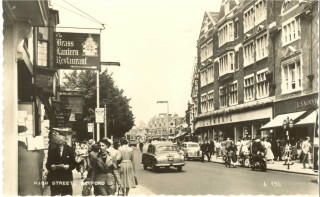 The shops I miss, were competitive, and had window displays which you enjoyed gazing at: Steabans the gents outfitters, Burtons etc., Jewellers Morse, H. Samuel, Maitlands. Butchers, Dumbletons, Gibsons, Dewhursts, Fishers. Off Licences, Findlaters etc. The department stores, Cawdells, Trewins, and Clements. The old market, what a great selection of traders. If you entered by the entry next to Henry Kingham, you met a row of greengrocers, Browns, Southwoods, Bone, Turners. What a variety, from day old chicks & pets, to crockery, silks & Satins, even ice cream, Ceresales & Grillos. Shoe shops, Saxone, Dolcis, Freeman Hardy & Willis, Hiltons, and many more. Bakers, Brightons, Garners, Bucks, Spurriers. Wet fish shops Anchor & Mackfisheries. Restaurants: Bicards. A.B.C. Lyons, Bucks, The Regency Tea Room. Fish & Chips shops, Duce, and Westons. Music, Elliotts. We had a good selection of what is now described as D.I.Y and Electrical Shops. Nostalgia takes me back, and I am more than sure that I could continue mentioning many places that I miss. Sadly competition to-day is very limited, old names may still exist on packaging, but the names are often owned by one organisation. This page was added on 03/12/2013. I love reading about other peoples’ trips round Oxhey village. My Nan and Grandad used to run a pub half way down Villiers Road between the Villiers Arms and The Rifle Volunteer. It was called The Prince of Wales. Number 78. Gone long before I was born in 1960. I wonder if anyone remembers it? My grandparents then moved down the road to number 35. My other Nan ran the newsagents shop at the bottom of Aldenham Road, the one in the middle. My sisters were born there. There was the post office one side run by Mr and Mrs Hack, and Rosewood Stores the other side run by Mr and Mrs Varley. We lived in the middle, Brown’s Newsagents. It’s been a kebab shop or similar for years now. We left there in1969 and moved to Oxhey Avenue. I remember Sheila and Bill at Sheila’s Pantry very well. And Bardon’s the newsagents, and the lovely smell in Crawleys hardware shop. Miss Horwood up the steps next to the fish and chip shop, she sold penny sweets, we used to get an old sixpence once a week to spend in there. We moved again in 1980 to Amberley Terrace at the end of Villiers Road. There used to be a tiny hairdressers opposite, I think it was called Molly’s. And up the road from us was the post office and Bonds Chemist, opposite Lovedays, one of the few ‘old’ shops left. I remember Charlie who worked in Palmers, and I remember Alf the butcher. It was a lovely place to grow up with Watford Heath and the park round the back, and also Paddock Rec with the fields behind where we went tadpoling get as kids. And brownies at the Methodist Church in King Edward Road where my sisters and I were all christened. From Villers rd turn left into Capel rd past Palmers delicatessan on your left, opposite was Lovedays the bakers next to that was a tv shop and a sweet shop called Candy Stores. 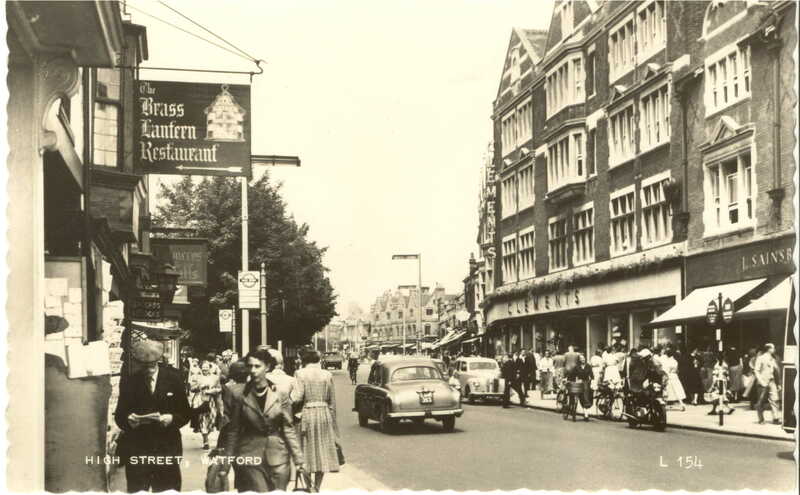 Opposite was a butchers called Dixey then a greengrocer that i cant remember the name of. i know the one down the bottom of Capel rd was called browns ran by Keith and Ethel because i worked for here brothers in Watford Market. I remember opposite browns use to a Hairdressers, and on the other side of the road a grocers called Hopcrafts. Wait a sec i’m sure there was a pet store next to Candy Stores. Remember in part 1 i told you the pub opposite Crawley’s was called the Rifle well is not its called Villers Arms. The Rifle is on the corner of Lower paddock rd. Going up lower paddock rd from Villers rd you would past Keyers hall on your left better know as Oxhey Conservative club further up on the corner of Field rd was a newsagent called Challoners. Its still there now. i was a cub and a boy scout we called 29th south west herts. We used to practise our camping skills in the fields, at the bottom of Hayden Road. The cubs were run by Mr Williams, and he scouts were run by Harry Hart, who worked for Colne Valley water company,he was helped by a man called Peter Preston. We were taught how to cook on an open fire, something that wouldn’t be allowed in this day & age due to health & safety, also we would wheel a big cart around he streets of Oxhey, collecting jumble for our sales. Back to London Road at the junction of Vale Road, was Bushey Vale garages, it is now a skoda dealer. Further up on tthe right was Bushey Manor school, where I was a pupil. The school has now moved, into the grounds of the old Royal Masonic school. Okay, lets go back down London Road, & turn left into Vale Road, at the bottom of Vale Road was the Colne Valley water company, i am sure the small houses next to it were owned by them? We are now in Aldenham Road, follow this up towards Bushey Station, where Oxhey infants used to be next to Bushey Baptist church. The chinese takeaway opposite is still there, there used to be a bookshop on the corner of Aldenham Road in Chalk Hill. The pub opposite was the Victoria, in the 80’s, people used to think it was the queen vic from Eastenders, because the Victoria Walford, sounds like the Victoria, Watford. Carry on down Aldenham Road there used to be a small cafe & an electrical shop, alas they are no more! bringing us right back where we started: BUSHEY & OXHEY STATION. Whoops….Bushey Station.! I hope you enjoyed our little trip round Oxhey. Walk up pinner rd from bushey arches passing Bushey &Oxhey in the days of british rail its now called Bushey station. They used to be a taxi office on the station forecourt,its now in the car park. Oppisite the station used to be a petrol station National i think, where the gave away James bond style gunshots to stick to the back window of your car. Its now a block of flats. Continue up Pinner rd past the estate agents on the corner of Grove rd and on to the laundrette at the junction of Oxhey ave and Pinner rd. Someone told it was once a co op anyway its a hairdressers now. You can still the mark on the wall where the built in post box use to be. Oppisite this was a grocers shop called west stores, with the table hall next to it. In 1973 me and a group of friends organised a disco in aid of Hillside hostel a home for the handicapped which had been built on the side of table hall. The friends were Charlie and derek loveday from the bakers in Villers rd Dave simpson my mate who worked with me in Watford market and John baldwin my mate from school. We held our gig at st Matthews church hall, tickets were 20p each and where sold at loveday bakers. We made £10 and page three of the Evening Echo and that was our 15 mins of fame. Anyway continue up Pinner rd and on your left was a little grocers shop called Sheila’s Pantry its now a secondhand record shop. Left into villers rd, used to be a pub called the Royal oak on the corner. Carry on down Villers rd on your right was a laundrette with a hardware shop next door i think it was called Crawleys. Anyway oppisite that was a Barnes Newsagent where i did my first paper round and got £1 per week. Carry on down Villers rd past the pub i think it was called The Rifle Volunteer then past Mrs Horwoods grocers shop, she use to close half day on wednestday. past the chip shop next door, they were two shops oppisite it but i cant think what they were. Thats the end of part one of our little trip around Oxhey in the early 70s, Part two is comming soon.